Over the Labor Day weekend, my husband, Shawn, and I journeyed four hours west of Paris to see this legendary structure. Our first sighting of the 1,100 year-old Mont-Saint-Michel Abbey came with cornfields in the foreground. As we edged ever closer to the dramatic structure, we drove through villages plentiful with grey stone cottages thoughtfully accessorized with flower boxes that teemed with pink and red geraniums. Some homes were topped off with thatch roofs. The scenery shifted quickly – from the cornfields awaiting the harvest, to emerald green pastures with sheep placidly grazing, to a sea of vehicles parked not far from the wall originally designed to fortify Mont-Saint-Michel’s village. Signs in the parking lot reminded visitors that if they parked carelessly, they might end up carless, thanks to the abbey’s tide that travels eight miles in and out each day. 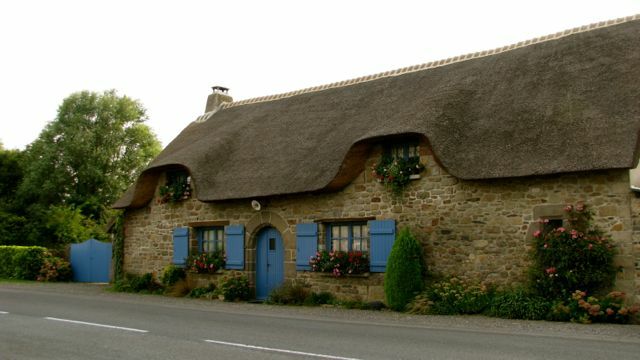 During our visit, locals joked that one can experience all four seasons in just one day in Brittany and Normandy. Like Claude Monet, who was known for depicting landscapes on canvas in varied lights and seasons, such shifting weather patterns around the region made visiting and photographing Mont-Saint-Michel a delight! On our first afternoon there, the sky was blue with just a few fluffy clouds, whereas during our second visit the next morning, the abbey was shrouded in a thick veil of grey clouds at the outset. The highlight of our visits, by far, was walking out on the rocks and low tide mudflat just below the structure. When we ascended to the abbey the first day, we were intrigued by the vista featuring large groups of visitors being led out into the vast sandbar areas. As we approached the water, we saw signs warning explorers of quicksand and riptides. Since Shawn was still recovering from leg surgery, he waited on the steps of a tiny chapel, watching me as I embarked on a mini adventure out toward the sea. At the time, it was hard to believe that the immense area in which I was walking would be submerged in rushing water in a matter of hours. The moments were magical! Initially, I had to wade through water about ankle-height. Within about twenty minutes, the water had climbed higher so that it was reaching the hem of my knee-length skirt. As the current grew stronger, I rushed back to ever-patient Shawn, who had divided his time between quiet reflection on the stairs, and the petting of two horses that could be rented for an ocean-side ride. By then, my toes were covered in a grey, clay-like sand that would look at home in a spa. For more than 1,000 years, the Benedictine monks stacked the abbey’s rooms one on top of another around the top of the dramatic rock, creating chapels, cloisters and functional rooms. The aim was to elevate followers as close to heaven as possible. The monks in residence at the imposing abbey grew herbs and food for medicinal purposes. They also meditated and read the Bible. It was believed that the more secluded a monk was, the closer he could be to God. 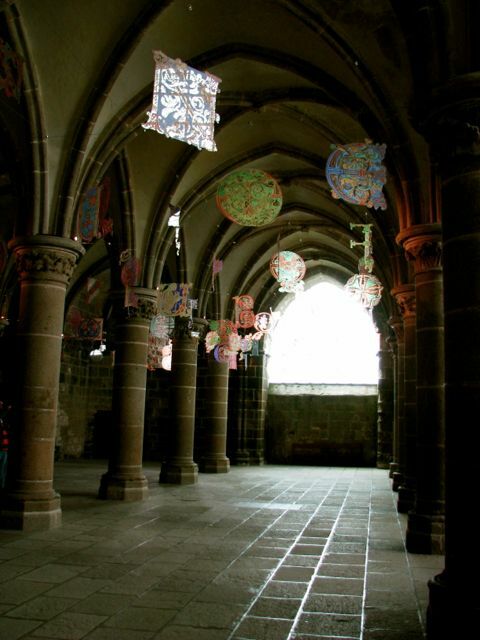 Mont-Saint-Michel’s interior is expectedly austere – reflective of the monastic lifestyles it once nurtured. The rooms are cool, with hard wooden features, and Gothic leaded-glass panels. From 1793 to 1863 the structure even served as an Alcatraz-like prison. 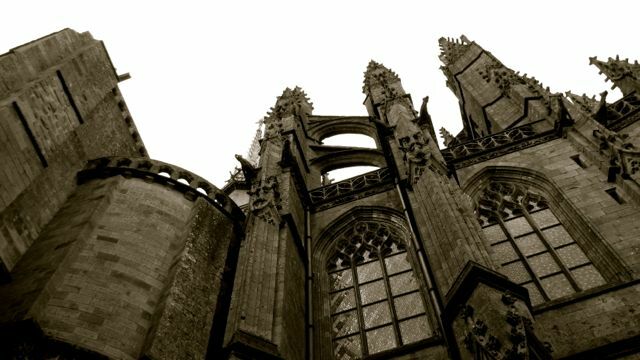 It housed 300 priests during the French Revolution. Throughout the centuries, monks and pilgrims trekked to Mont-Saint-Michel as did members of royalty wishing to pay homage to their patron saint. 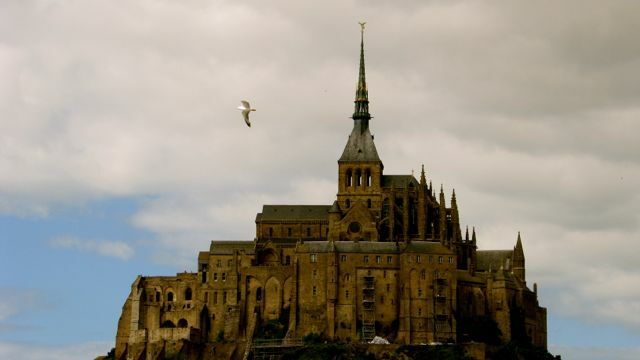 In past time, Mont-Saint-Michel was the fourth most important place for Christians. Nowadays, more than 3.5 million visitors descend upon this splendid French abbey. Over the centuries, a self-sufficient village, now plentiful with restaurants, souvenir shops, hotels and a post office, sprung up in the prime real estate just below the abbey. Today, the village’s sole cobbled street, which bustles with shopkeepers selling crêpes, Breton cookies and souvenirs, offers a footpath leading up to the abbey. In past centuries, merchants peddled candles and medallions for pilgrims there. Today, only thirty people inhabit the village. Despite Mont-Saint-Michel’s impressive history, not many original artifacts remain. French Revolutionary troops defaced the saint statues on the columns and the original windows fell victim to fire, lightning and the Revolution. Even the abbey’s archives (which were whisked away to a nearby city during World War II) were destroyed during the D-Day invasion. While navigating the vast rooms, I tried to imagine the challenges builders from past centuries faced as they transported hunks of granite, as well as other building supplies to the spot. How did they build so high on the unyielding rock before the land bridge even existed? France’s Brittany and Normandy regions have played tug of war over Mont-Saint-Michel for ages. This rivalry is reflected in playful postcards that are for sale on Mont-Saint-Michel’s main street which depict the two regions duping it out. Initially, Mont-Saint-Michel belonged to Brittany, yet the 1878 land bridge building resulted in a changed river flow. Much to the chagrin of cartographers tasked with mapping out the region, this led to Mont-Saint-Michel shifting to Normandy’s hands. Mont-Saint-Michel is no longer technically an island, because of the causeway that was built there in 1878. Though the roadway allowed visitors to visit regardless of the tide status and increased sightseeing numbers, the manmade causeway eventually stopped the natural water flow around the island. This resulted in the silting of the bay. Construction of a new bridge and dam are currently being undertaken and the hope is that Mont-Saint-Michel can again achieve island status. I’m still torn between whether I prefer Mont-Saint-Michel enveloped in an early-morning fog, or basking in the warm glow of afternoon sunlight. Perhaps I shall adopt Claude Monet’s approach. Note: This is Part I of a Mont-Saint-Michel series. Click for Part II – Mont-Saint-Michel in Black & White.